Let's set the record straight: turmeric, curcuminoids, and curcumin are not interchangeable terms. 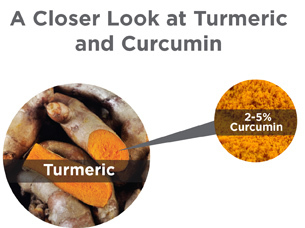 Curcumin is a small, potent, and important part of turmeric. This distinction has implications when looking to select a nutritional supplement, when educating patients, as well as for clinical dosing. 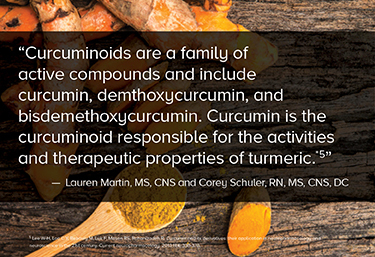 Curcuminoids are a family of active compounds within turmeric. Curcuminoids are polyphenolic pigments and include curcumin, demethoxycurcumin, and bisdemethoxycurcumin. Curcumin is the primary curcuminoid in turmeric and the compound for which most studies have been done. A simple exercise is to independently search each of these curcuminoids as criteria in your favorite medical and scientific article database (e.g., Pubmed) and compare the cursory results. Although turmeric is thought to possess therapeutic properties, the curcuminoids complex found in the rhizome of turmeric contains only 2.5-6% curcumin. Curcumin compromises approximately 77% of the curcuminoid content.3 To state this differently, it is understood that curcumin is the most abundant curcuminoid. It is also the most studied curcuminoid. Curcuminoids are only a small fraction of the turmeric rhizome and the rhizome is only one part of the plant. Unless explicitly stated that there is a different ratio of curcuminoids, it is assumed that the natural ratio of 77% curcumin, 17% demethoxycurcumin and 3% bisdemethoxycurcumin with variances is maintained in a commercial product. This provides context to the conversation about using these plants in clinical practice. However, simply comparing mass alone of curcumin, curcuminoids, or turmeric products fails to address the widely known challenge of bioavailability. Although curcumin has a wide range of biological activities, in vivo studies have found the bioavailability of curcumin in humans and animals to be low.4, 5 Additionally, curcumin has a high metabolizing rate and rapid systemic clearance.4, 5 Because of its poor absorption efficiency, it is difficult for orally administered curcumin to reach blood levels sufficient to exert its bioactivities. To overcome this problem, several curcumin preparations have been developed to increase the bioavailability of curcumin after oral administration with varying degrees of success. View one study published in the Journal of Nutritional Science and Vitaminology1, which compared three popular curcumin formulations. 2. Asher GN, Spelman K. Clinical utility of curcumin extract. Altern Ther Health Med. 2013 Mar-Apr;19(2):20-2. 3. Lee W-H, Loo C-Y, Bebawy M, et al. Curcumin and its derivatives: their application in neuropharmacology and neuroscience in the 21st century. Current neuropharmacology. 2013;11(4):338-78. 4. Sunagawa Y, Hirano S, Katanasaka Y, et al. Colloidal submicron-particle curcumin exhibits high absorption efficiency-a double-blind, 3-way crossover study. J Nutr Sci Vitaminol (Tokyo). 2015;61(1):37-44. 5. Lee W-H, Loo C-Y, Bebawy M, Luk F, Mason RS, Rohanizadeh R. Curcumin and its derivatives: their application in neuropharmacology and neuroscience in the 21st century. Current neuropharmacology. 2013;11(4):338-378.